Replacement Pole designed specifically for the Clip-On Paddle FlagÂ® Kit (EZ885). This durable 2 1/2 foot tall fiberglass pole has a wide molded clip that easily attaches to any car or truck window. Pivoting pole allows the flag to turn into the wind, reducing wear and tear on the flag. 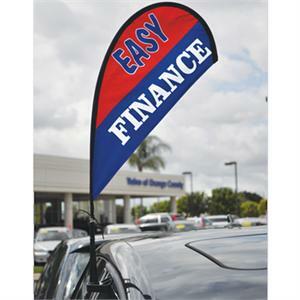 The two piece window clip pole design allows the flag & pole to be removed easily without rolling down the window.